It’s been four months since we started Ravenous Couple and not much longer that we first discovered the world of blogging. Several blogs got us hooked and planted the seed, but if we were forced to point one out on a police line up, Rasa Malaysia would be the guilty one. Yes, Bee you didn’t know it then but now you do. Your blog really inspired us to enthusiastically share our love of Vietnamese cuisine and learn about others as well. So when Bee asked us to write a guest post on Bo Luc Lac (Vietnamese Shaking Beef), we were surprised and flattered–you mean us newbies?. But we gladly accepted because it’s one of our favorites. However, we knew that we would have to step up our game to post on her site…so without much further delay, check out our recipe of Bo Luc Lac (Vietnamese Shaking Beef) on Rasa Malaysia. Heat a large wok or pan over high heat. Add about 2 tbs cooking oil and when it begins to smoke, add an even layer of beef and allow to sear for about 2 minutes, before “shaking” to sear the opposite sides for about another 1-2 minute more to brown all the sides. Do this in batches to cook all the beef if necessary. Enjoyed your guest post over on Rasa Malaysia. No way I can not believe that you are new bloggers. Such professional photos and interesting postings. 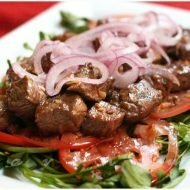 Delicious looking beef recipe. WizzyTheStick: Thank you for the kind words! It's true–we're real newbies, but we really enjoy what we do and love it so far. Thanks for stopping by and hope you visit often. Congrats! Forget newbie … you shot straight up to the pros. Wow, Rasa Malaysia? That's so cool! Ninette: We're not sure about pro's but we try our best! Looks fantastic, love the name! Rasa Malaysia really is a great blog, one of my favourites. Marc: Thank you. We agree it's one of the very first blogs we started reading. pablopabla: thank you for the kind words. We enjoyed guest posting bo luc lac on RM's site. We love to share Vietnamese food and hope you come by and comment often! Such a cute name and the dish looks fantastic! pigspigscorner: Thanks! 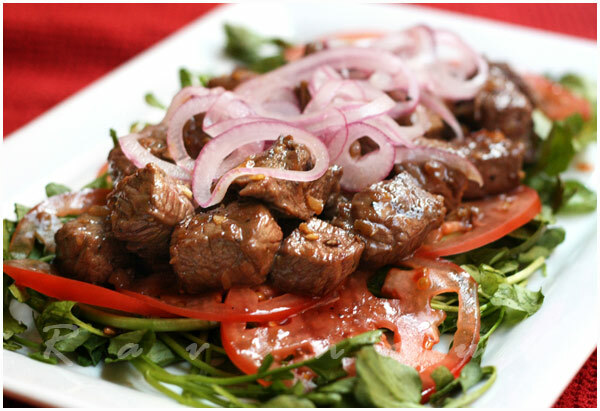 Bo Luc Lac is often served at big parties because it can look so pretty! 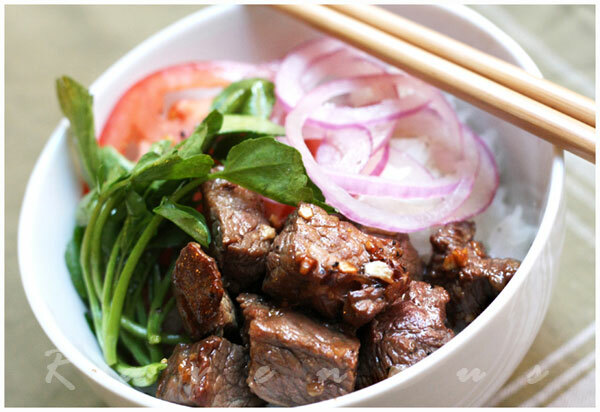 Bo Luc Lac is one of my favorite Vietnamese dishes! Your version looks delicious. I will definitely have to make this soon (among all the other great Vietnamese dishes you've already made!). Thanks guys! oneshotbeyond: Bo luc lac is also can be presented as a steak salad when served this way and makes for a great presentation. Krissy: There's definitely lots of versions of bo luc lac, sometimes we even deglaze the pan with the vinaigrette to make get more beefy flavor in the sauce. i just realized that i always order this beef dish (with tomato rice) for lunch when i didn't prepare anything from home…now i can imitate it and impress the heck outta sous chef…hehehe thanks for sharing! Your photos are gorgeous! I wish I could taste the dish! Rita: Ohhh we're eager to see you do a lil' shaking for sous chef! Hummingbird Appetite: Thanks! It was the beef that was shaking with fear as we gobbled it up. Wow! What a fantastic blog! Keep up the great work! Congrats guys! I fell in love with Rasa Malaysia early on too and she's been kind enough to help me with my questions about one or two recipes…its fantastic to see y'all there! christopher: Thank you for visiting we hope you enjoy our Vietnamese and Asian recipes! Miakoda: Thank you! We made a few of RM's recipes as well and it's great. Your blog is super fun! I'm Vietnamese too and I really appreciate seeing our wonderful recipes online. LaLa: Thanks for reading and taking time to comment! Let us know if you ever make bo luc lac or any of our other recipes! wow! i just made this and it was DELICIOUS! i can't wait to try more of your recipes. anabella: We're so glad the bo luc lac turned out great for you. Please let us know if you try any of our other recipes! i am so linking this on my blog!!!! sparklingcosmic: Thanks for taking the time to leave a comment on bo luc lac. Hope to see you comment more in the future! I tried your recipe..omg!! heavenly delicious!!! Thanks for sharing it! I love vietnamien cuisine (though i have never been there, but my husband did, and he said that the bo luc lac is so tasty! )… please share more recipes to us!! Thanks!!! 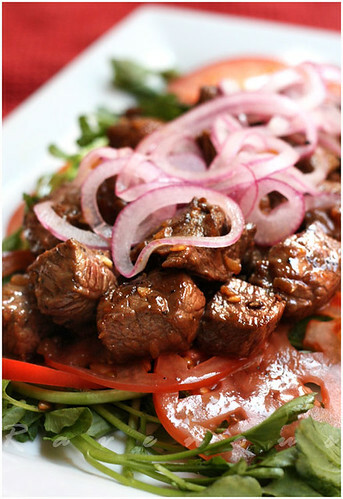 sparklingcosmic: So glad you enjoyed our bo luc lac recipe!! We have so many more Vietnamese recipes to try so let us know how things go! oo i can't wait to try to make this…love your blog by the way! Yvonne: thanks for visiting our blog! Let us know how our bo luc lac recipe goes for you. Madeline: This easily serves 3-4 people since it's also a salad as well. Hope you like it and let us know how it goes! Just recently found your website. You have beautiful pictures. I have made shaking beef before (from a slightly different recipe) and then found your recipe online. Tried it last night. It came out beautifully. Was a tad too sweet (personal taste) and will adjust it next time accordingly. Can't wait to try your other recipes. Thank you again! Anonymous: Thank you so much for your feedback! We're so happy it came out beautifully for you. As always, we love to hear from you if you make anything else! Thanks for linking me to this recipe, other than Slanted Door's pricey but delicious version, everywhere else pales in comparison. Looks like you are serving it with watercress? which how it really should be, so many are served with bell peppers and onions. I really enjoy you guys sharing all of your Vietnamese recipes. I will try this out and let you know, and maybe even post it on my blog. Bonnibella: Yes, definitely on watercress. The pickled onions and tomato is also very traditional. Let us know how it goes! Hi RC, it's Marjie from Sweet Sour Salty Spicy Crunchy… finally clicked on your name and found your blog ~ and it's just the blog I've been looking for! I need a true education about what I have been eating for the past year and a half and you're going to help me with that. This picture of the Bo Luc Lac has really gotten to me. Do you know of a good spot to get it in Saigon? I'm really happy to find you! The photos are lovely and the Bo Luc Lac is mouthwatering! Great post, and I hope to meet you @foodblogforum! Recently i chanced upon your blog and found this wonderful recipe. During my many business trips mainly to Hanoi and Ho Chi Ming city, we were treated to wonderful vietnamese cusine. I had this dish actually at Hanoi and fell in love with it. when i saw this recipe, i told myself that i just got to try it. and that i did 2 days ago. It was so good. thank you for sharing the recipe. there was one other dish that i tried in Hanoi which I adore – the name of the dish escapes me. it has burnt rice, with some fish, in a tangy broth. do you happen to know what this dish is called? @Josephine: thank you so much for sharing with us. Not one hundred percent sure what that dish you're talking about. Join us an facebook and post any photos you make there! Wonderful presentation with very nice pictures. Best wishes. This "bo luc lac" is one of our favorite dishes with beef. The name reminded me of a funny story a few years ago when I went to a Vietnamese restaurant with some American friends. When seeing the name "shaking beef" (actually it was shaky beef on that menu) one guy jokingly asked "is it made with mad cow meat?" That was during the time the mad cows desease was in the daily news. One some menus, I have seen it translated as "grilled or stir-fried cubed beef, or diced beef". Guess that came from the shape of the beef pieces (cut up like the dice, hot luc lac in Vienamese). Saw this on rasamayaysia website. Recipe is wonderful but plan to make it again but would like to add the tomato paste rice and lime/salt/pepper dipping sauce. Would you please post recipes for these? Thanks! Hullo, just wanted to add another tidbit I acquired during my few years in NYC. Surprisingly, there is one Vietnamese restaurant named Saigon Grill (it's a chain) that has the best Bo Luc Lac that I have EVER tasted. That includes my grandma's, and also places far and wide in Little Saigon (Westminster), San Jose, Sai Gon, and Ha Noi. I hate to admit it because Saigon Grill does pretty much everything else in an awful way. I mean, embarrassingly bad. But their Bo Luc Lac with nuoc mam and fried taro chips are to die for. Try it out next time you're in Manhattan! I’m a Vietnamese who grew up in the US, with nose in the books & never got a chance to practice much in the kitchen growing up. Running into your blog has surely inspired me to try out some Vietnamese dishes, especially over the holidays with my family. Thanks so much! This dish was absolutely delicious and the presentation was great (i couldnt find the watercress so I used lettuce instead), it went really well with the vinaigrette sauce!!! Thank you guys so much! I can’t wait to see more of your dishes!! Món này xuất phát từ bên Tàu, và món này được gọi là bò lúc lắc vì thịt được cắt ra thành những miếng vuông như con xí ngầu (dice) hay còn gọi là súc sắc hay lúc lắc, chứ không phải là lúc lắc cái chảo nên gọi vậy. Người Hoa chiên xào đều lắc lắc cái chảo cho nó chín đều thịt, nếu mà vì vậy mà gọi là lúc lắc thì sẽ có những món heo lúc lắc, cá lúc lắc, mực lúc lắc rồi. I don’t know if this is a dumb question, but is hoisin a suitable substitute for thick soy sauce? Awesome recipes, my girlfriend loves them all. She like the UN of cooking and she’s added your Vietnamese recipes to her repertoire. The shaking beef is our favorite so far. I made this tonight, it was delish! Thanks for the recipe! Hello, can I use tamari instead of the thick soy sauce? We have food allergies and can only use gluten free soy.